As Inbound Marketers, we often come into contact with business owners who say “This has been working for 10 years - why isn’t it working anymore?” Times are changing and with that consumer mindsets and products are changing with it. If you've been marketing to the same customers all this time, chances are the customers have changed beyond your marketing strategies and tactics. Is this you? We have some steps to get you thinking about your Buyer Personas and how they should evolve. This is a way to separate your clients into specific categories, then create content targeted specifically to them. If you have never created these personas, or have personas but haven’t looked at them in awhile, it’s time to revisit and reevaluate. Follow these 5 tips on how to update your personas and make them lead-effective. It’s simple. We don’t know. Every business is different and has different consumers they reach out to. This is the time to do a ‘business soul-search’ and, find out who you WANT to reach, and include them. You could have 3 personas or you could have 10 - as long as you are developing personas based on realistic and viable objectives. No matter if you are an established larger business or new, smaller business, it’s important not to exclude the buyers who are successfully closing with you, and then add on personas to expand your desired client base. We know your business has changed from when it began because marketing has changed significantly, even in the past year. Where we used to have 10 products to choose from on a shelf, we have thousands of products to choose from on the infinite shelf of the internet. When you go over last year’s budget and progress, and next year’s goals, don't breeze through your yearly marketing plan. Review old Buyer Personas and see if there is a new niche you want to start capturing, and any new ways you can serve the needs of the clientele that has been serving you so well. Your Personas should be who you WANT to sell to and not just who you COULD sell to. The clause to this rule? You should WANT to continue to sell to your best customers! Take some time and analyze who you have already won and who your best customers are RIGHT NOW. Your best customers will have a trend that may not match up with your buyer personas - and in that case, they need to be their own persona. Then evaluate all the niches you want to target - and create more personas just for them. Learn more about how to create a buyer persona here. You’ve noticed for the past couple of months your traffic has been decreasing from the previous year. The blogs you post aren’t getting much traction and your offers are falling flat. You may be targeting the wrong people and pushing the wrong content. By fixing your website to correctly target the consumers you’re trying to reach - you can fix your content and boost your website traffic, which will in turn boost business. 1.) Awareness Stage: The buyer realizes they have a problem. 2.) Consideration Stage: The buyer defines their problem and researches different options to solve it. 3.) Decision Stage: The buyer chooses a solution. Buyer Personas are a crucial part of The Buyer’s Journey and for meeting leads with the content you have. By focusing on the characteristics of the consumers you want to sell to, you can create content that hits them at each stage of The Buyer’s Journey. Buyer Personas are a simple but effective way to set your company's goals, and help align your marketing objectives for the upcoming year. 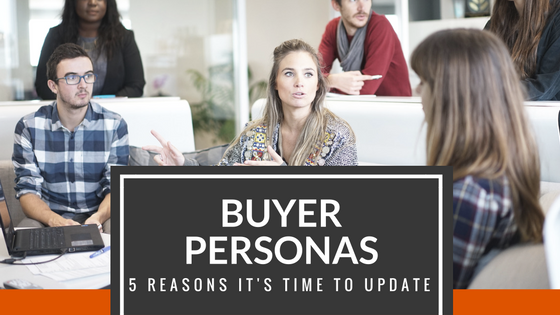 With that said, buyer personas are only one piece (but a very important one) of your inbound marketing campaign. To learn more about how to effectively create an Inbound campaign for your company, download our checklist below.